Liz's Paper Loft: My Creative Time January Sneak Peek ~ Day 4! Hi! Welcome to My Creative Time January Release Sneak Peek ~ Day 4! Can you believe that todaydis the last day of the sneaks? Starting tomorrow you will be able to purchase any of the stamps and dies! Whoo Hoo! If you didn't get a chance to see yesterday's project use the Bubblegum Treat Box die, that's ok I'm doing another take on it! I thought these would make cute gifts for some of my "little friends"! 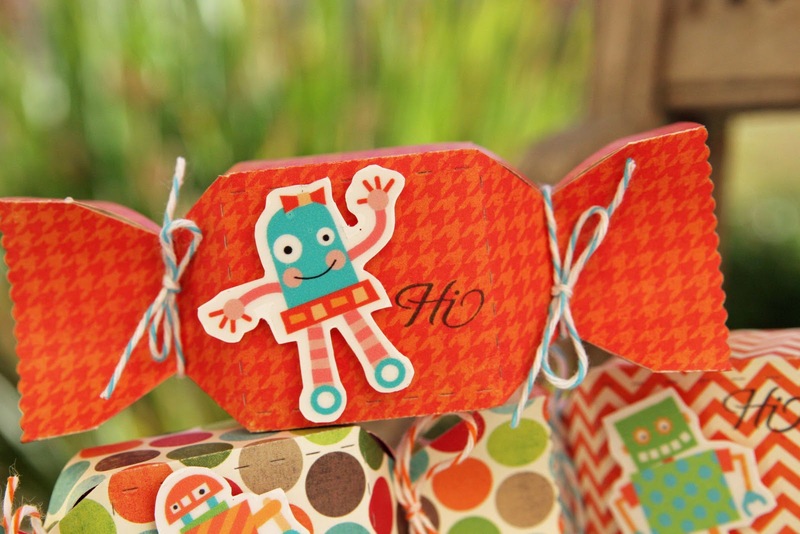 They would also make darling party favors for any occassion! That's the fabulous thing about this die, you can dress it up or down for the event...kind of like the "little black dress"! This die is the perfect size, it's fits all of your 6x6 paper pads! I use EAD Designs Stickerz and a Teeny Tag Greetings stamp to embellish each box! great job on these bubble gum boxes these are so cute. Can't wait to get my hands on them. Love all the bright colors on the papers you chose. The robots on the front are so super cute. My daughter gives this one two thumbs up. Wow what a wonderful project!!!! You are so right these really are fabulous!!!! Way to go Liz!!!!! 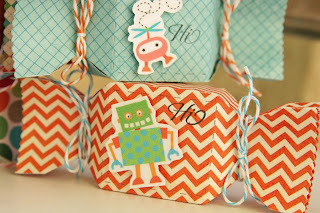 Adorable bubblegum treat boxes...a must have!! AWESOME job Liz!! 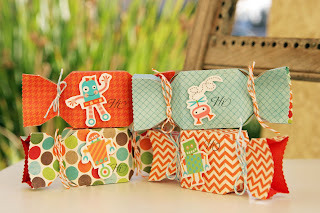 Love the fun pattern paper and those adorable robots!! What cute little treats. This die is going to be so much fun to use and decorate. Wow these are so cool, my son would love these. Thanks for sharing. These are DARLING!!! How totally cute and fun!!! Absolutely adorable! I love that paper (did we buy that together? ), and the EAD stickers match it just perfectly! 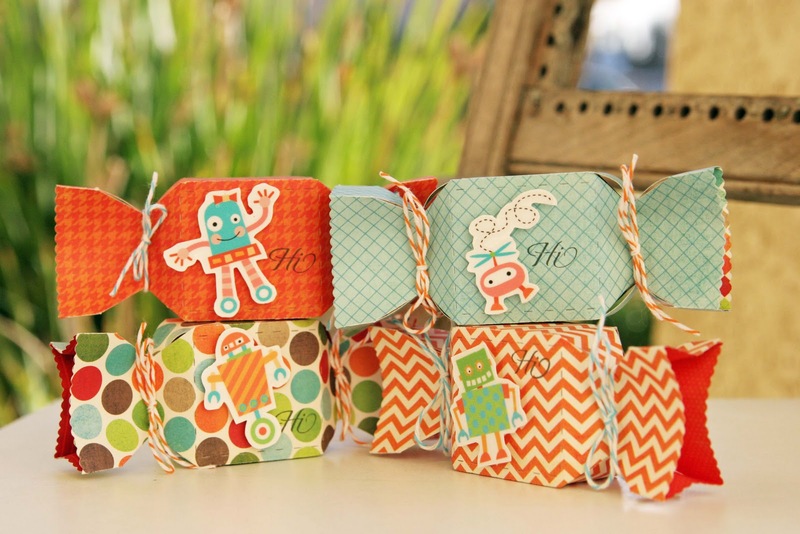 Such super cute little treat boxes! I love the paper you chose for these, it's perfect with them! I absolutely love how these can be cut on 6x6 paper! Sooooo cute. Love those stickers on the outside they are perfect. What fun colors for the treat boxes! Great for childrens parties! You are really making me want some of the stickers! I might hve to cave! How sweet!, definetly this is the new crafting LBD! TFS such lovely project! These are really cute!! just love what all of you have done with this die! I so want this die, love what you did with it. Love your Bubble gum boxes! They are so adorable! You did a wonderful job! Have a wonderful day! Wow, what a cute idea! I love the paper. I'm so jazzed about this die - gotta have it! Your boxes are so cute. 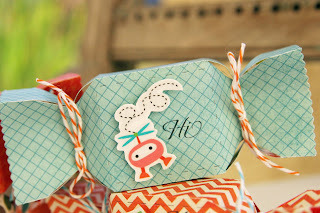 A great idea to use stickers and a quick stamp with a little twine for a faster project that looks great. these are so cute, lovin the paper!! Awesome party favors! The robots are adorable! Really cute Liz! Love that die and what you did with it. I really like the robots. Thanks for sharing! These are adorable!! I absolutely love the paper you used... so bright and cheery!! I am super excited to get my hands on this die! Thanks for the great week of sneak peeks! Love this ... so many great ways to embellish this die. so cute! I love the stickers! can't wait until I can buy mine!! thanks for a great week!! Love this one. Cant wait to order. These are so cute! Love the papers, colors and the stickers are so fun! Those are adorable! I love the robots and the bright colors! Love your boxes and so colorful. so cute-you did a super job! These are so cute. I love the paper you used. I just can't get over how different this same die cut for the box looks with each of you ladies on the DT. WOW! I love these fun papers, sentiment stamps, and images you used on yours. Fun stuff going on! Such fun papers on your treat containers! Omg! These are so cute!!! 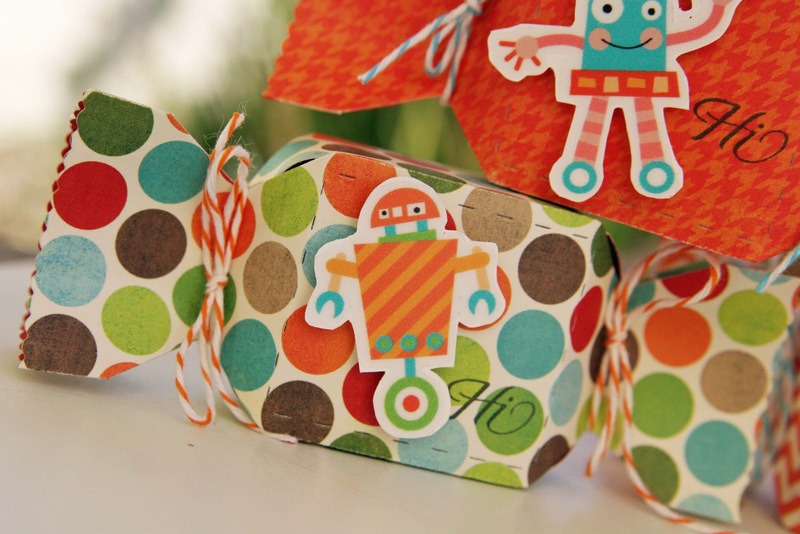 I love the paper you used and those cute little robots! TFS! These projects you made with this die are fabulous. I love the banner die I got. I think this will be on the top of my list. I totally adore these. What a great project. So cute! Any "little" friend would love to get one of those! What cute little treat boxes! Love the paper! Great job! Very cute treat boxes love the paper. Love that bubble gum die. Super cute! Love the little images. Love the box. I have to check that out!!! Your Party Favor Treat Boxes Are Too Cute!! Just Love Them & The Colors Thar You Used !! These are adorable!!! :) What great Valentines for my kids' classes! How adorable!!!! I like the fresh colors.